Sara Gress, Kelly Mudlo, Micheal Rangel, and Shelby Wagoner from the Bellarmine University Physical Therapy Program's Pathophysiology of Complex Patient Problems Project. Lupus erythematosus, sometimes referred to as lupus, is a chronic inflammatory autoimmune disorder that appears in several forms; discoid lupus erythematosus (DLE), which affects only the skin, and systemic lupus erythematosus (SLE), which can affect any organ or system of the body. Other forms include drug-induced lupus, antiphospholipid antibody syndrome, and late-stage lupus. Systemic lupus erythematosus belongs to the family of autoimmune rheumatic disorders that can be characterized by injury to skin, joints, kidneys, heart and blood-forming organs, nervous system, and mucous membranes. Discoid lupus is a limited-form of the disease confined to the skin presenting as coin-shaped lesions, which are raised and scaly. Discoid lupus rarely develops into systemic lupus. 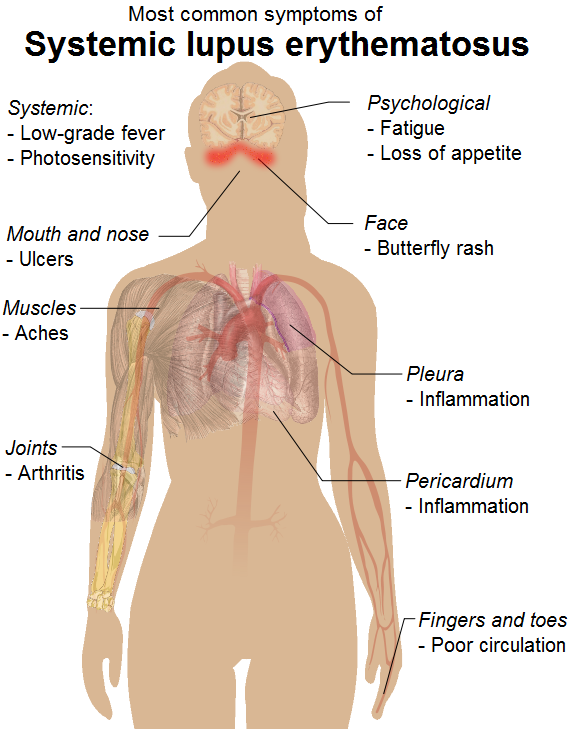 Systemic lupus is usually more severe than discoid lupus and can affect almost any organ or system of the body. For some people, only the skin and joints will be involved. In others, the joints, lungs, kidneys, blood, or other organs or tissues may be affected. The exact cause of SLE is unknown, although it appears to result from an immunoregulatory disturbance brought about by combination of genetic, hormonal, chemical, and environment factors. Some of the enviormental factors that may trigger the disease are infections (e.g., Epstein-Barr virus), antibiotics, and other medications, exposure to ultraviolet light, extreme physical and emotional stress, including pregnancy. Although there is a known genetic predisposition, no known gene is associated with SLE. Relatively rare disease which occurs in 15-124/100,000 of the population worldwide. Most common in persons between the ages of 15-40 years. About 6-19% of lupus patients, the diagnosis was made after the fifth and sixth decades of the patients life. 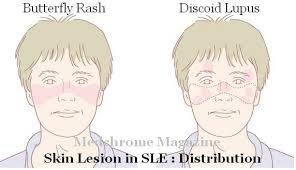 During the disease course, discoid rash lesion is significantly more common in men compared to females. The disease is 2-4x more frequent and severe in among nonwhite populations around the world and tends to be more severe in men, pediatric, and late-onset lupus. More prevalent in first-generation family history more often when compared to the general population. Patient is a 46 year old caucasian female who works full time as a secretary. She presented to the hospital with a six-month history of generalized weakness and significant weight loss of 40 lbs. Systemic Lupus Erythematosus, acute inflammatory arthritis of elbows and knees. This patient has been treated for past episodes of leukopenia on more than two occasions. Patient presented to the hospital with a six-month history of generalized weakness and significant weight loss of 40 lbs over the past 4 months. Over the past two weeks, she has been having progressing symptoms of worsening dyspnea. She has been unable to do yard work due to her fatigue and pain in her elbows and knees. She has had to take leave from work for several weeks due to her inability to type and sit for long periods of time. Patient has no history of smoking, drug, or alcohol use. She has had a history of leukopenia on several occasions, but this episode of symptoms seems to be the most exaggerated. She has not hospitalized for any other relevant conditions. Her goals are to return to work and to be able to perform household duties with less pain and fatigue. 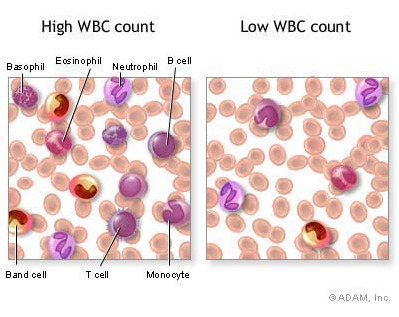 Lab results revealed anemia, leukopenia, elevated blood urea nitrogen, and elevated creatinine. Urinalysis showed trace proteinuria. Integumentary observation: Patient presented with mucosal pallor, showed no signs of cyanosis, digital clubbing, pitting edema, skin rash, or joint deformities. Palpation/percussion: Examination and palpation of patient’s distended abdomen was non-tender to palpation. Palpation of lymph nodes revealed rubbery axillary and inguinal lymphadenopathy. Respiratory system: Decreased breath sounds and dullness to percussion were noted on the left base. According to the signs and symptoms this patient is presenting with, it was evident to her physician and other health care providers that she was experiencing progressing symtoms of systemic lupus erythematosus. It was recommended that she start the appropriate treatment which included physical therapy intervention. This patient was diagnosed early enough that the appropriate treatment could result in the desired positive outcome. Pt will be able to tolerate sweeping her floors at home for 20 minutes with pain no greater than 2/10 in her knees within 2 weeks. Patient will demonstrate education for joint protection and fatigue management by keeping a symptom and activity journal with daily entries for 4 weeks. Patient will tolerate aerobic exercise to improve fatigue management and cardiovascular health for 30 minutes 2x per week consistently for 4 weeks. 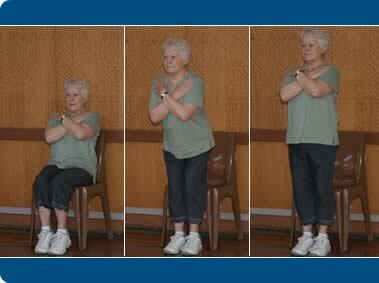 Patient will improve sit to stand from 5x in 30 seconds to 10x in 30 seconds (or 5x in 15 seconds) to improve function in lower extremity within 4 weeks. Patient will improve SLAM-R score from 20/81 to 45/81 within 6 weeks to reduce disease progression. Patient will be able to improve strength in knee extension from 3+/5 to 4+/5 to prevent osteoporosis and impaired motor function within 6 weeks. Patient is advised to use moist heat for additional pain management of joint pain (when not in flare) for no more than 15 minutes twice daily. You should plan to get 8-10 hours of sleep per night. Make a strategy to reduce stress: support groups, friends, family, and health care providers. Please keep your strategy in a daily symptom and activity journal. This will help you to monitor symptoms, bring information to your medical support system, and help you learn how to manage lupus. Record your pain levels with activities, amount os sleep, stress levels, response to medication, activities, exercises, cognition, and even your mood if you would like to keep track of changes and progress. Avoid: smoking, alcohol, altering medications, and missing regular checkups. Please alert your rhumatologist if you are unable to take your medication. Regular exercise helps prevent muscle fatigue and weakness. Carefully control and restrict some activities to manage exacerbation. Pace activities and conserve energy. Follow a prescriptive exercise plan, avoid excessive bed rest, and protect joints. Strengthen muscles to protect joints and prevent osteoporosis using your home exercise program. Please let me know if you have a sudden worsening of joint pain, and chart it in your symptom and activity journal. As many as 60% of adults with SLE develop overt renal abnormalities, and 10% to 15% of patients with lupus nephritis progress to end-stage renal failure.8 RTA is rarely associated with SLE and, if present, is more commonly of the type 1 than the type 4 variety.10 It likely represents the consequence of significant tubulointerstitial damage, which should signal the need for rapid treatment of the underlying lupus nephritis to avoid future renal insufficiency.9 If you have returning symptoms of abdominal swelling, excessive fatigue, edema, or high blood pressure/ dizziness on standing, it is important to contact your PCP or rhumatologist immediately as these could indicate kidney involvement and the need for immediate care. Cutaneous and membranous lesions should be prevented by decreasing exposure to ultraviolet rays/ sunlight and avoiding products containing alpha hydroxyl acids. Avoidance of excessive sunlight and sunscreen are encouraged to prevent rashes like the malar rash that was on your cheeks and nose. Bring these outbreaks to the attention of your rheumatologist for intervention as soon as possible to prevent further skin irritation or infection. Be aware that Raynaud’s phenomenon occurs in 20% of people.3 With Raynaud’s phenomenon, you would need to warm and protect the hands and feet from cold. Use mittens, keep hydrated, and skin moist. Anyone with antiphospholipid antibody syndrome is a high risk of thrombosis. Avoid sitting for longer than an hour; stand and walk to prevent some risk of a DVT. Please alert your PCP immediately or go to the nearest emergency room if you have signs of a blood clot. With physical therapy intervention, the patient was able to reach her goals. She has returned to work and is able to perform household duties in the absence of pain and with minimal fatigue. By discharge, the patient was in a remissive state with complete absence of pain in bilateral knees and elbows. The patient’s improvement on the SLAM-R indicates decreased disease activity and disease severity. The patient’s improvement on the Five Times Sit to Stand Test indicates increased functional lower limb muscle strength. When treating a patient with Systemic Lupus Erythematosus, patient education is key. It is important to inform them that refraining from smoking and protecting their skin from the sun can drastically improve their disease severity. Photosensitivity occurs in 75% of individuals with SLE. Smoking drives hypertension common in SLE and interferes with the benefit of hydroxychloroquine (Plaquenil), an anti-malarial drug used to treat SLE. Educating the patient about continuing their exercise regimen after they are discharged from physical therapy treatment is beneficial. Regular exercise helps prevent fatigue and joint stiffness. Furthermore, regular, moderate physical activity can prevent the neuroendocrine and detrimental immunological effects of stress. This is particularly important for an individual with an autoimmune disorder. During a stent of treatment, since the physical therapist will see the individual with SLE frequently, it is important to be a “physician extender”. Due to training in differential diagnosis, physical therapists are equipped with the knowledge to determine when a patient needs to be referred back to their primary care provider. Physical therapists should monitor any patient on corticosteroids or immunosuppressants for signs of infection. Avascular necrosis is a possibility in those on corticosteroids, most commonly in the femoral head. Another less probable site is the femoral condyle of the knee. If the patient exhibits insidious onset of unilateral hip or knee pain that is worse with ambulation but often present at rest with symptoms present over weeks to months, refer to primary care provider. Be aware of any changes in bone density and screen for the presence of developing osteoporosis before including any resistive exercise, muscle-energy techniques or self-mobilization techniques. This may be a side effect of years of steroidal anti-inflammatory medications. Long term steroid therapy has been linked to diabetes mellitus, hyperlipidemia, and obesity. Observe for any renal involvement. Signs may include weight gain, edema, or hypertension. If there are signs of cognitive decline, this is a reason for referral. Raynaud’s phenomenon may become present. If so, inform the patient of the importance of warming and protecting the hands and feet. In conclusion, it is important to know the possible complications associated with SLE in order to know how to best treat your patient and when a referral is appropriate. ↑ 1.0 1.1 1.2 1.3 1.4 1.5 1.6 1.7 1.8 Goodman CC, Fuller KS. Pathology: Implications for the Physical Therapist. 3rd edition. St. Louis, Missouri: Saunders Elsevier, 2009. ↑ 3.0 3.1 3.2 Lazaro D. Elderly-onset systemic lupus erythematosus: prevalence, clinical course and treatment. Drugs & Aging [serial online]. 2007;24(9):701-715. Available from: MEDLINE, Ipswich, MA. Accessed March 21, 2015. ↑ Faezi S, Hosseini Almodarresi M, Davatchi F, et al. Clinical and immunological pattern of systemic lupus erythematosus in men in a cohort of 2355 patients. International Journal Of Rheumatic Diseases [serial online]. May 2014;17(4):394-399. Available from: MEDLINE, Ipswich, MA. ↑ Pons-Estel G, Alarcón G, Scofield L, Reinlib L, Cooper G. Understanding the epidemiology and progression of systemic lupus erythematosus. Seminars In Arthritis And Rheumatism [serial online]. February 2010;39(4):257-268. Available from: MEDLINE, Ipswich, MA. ↑ 6.00 6.01 6.02 6.03 6.04 6.05 6.06 6.07 6.08 6.09 6.10 6.11 6.12 6.13 6.14 6.15 6.16 Porteous H, Morgan N, Lanfranco J, Garcia-buitrago M, Young L, Lenz O. Systemic lupus erythematosus associated with type 4 renal tubular acidosis: a case report and review of the literature. J Med Case Rep. 2011;5:114. ↑ Holloway L, Humphrey L, Heron L, et al. Patient-reported outcome measures for systemic lupus erythematosus clinical trials: a review of content validity, face validity and psychometric performance. Health Qual Life Outcomes. 2014;12:116. ↑ 8.0 8.1 Romero-diaz J, Isenberg D, Ramsey-goldman R. Measures of adult systemic lupus erythematosus: updated version of British Isles Lupus Assessment Group (BILAG 2004), European Consensus Lupus Activity Measurements (ECLAM), Systemic Lupus Activity Measure, Revised (SLAM-R), Systemic Lupus Activity Questionnaire for Population Studies (SLAQ), Systemic Lupus Erythematosus Disease Activity Index 2000 (SLEDAI-2K), and Systemic Lupus International Collaborating Clinics/American College of Rheumatology Damage Index (SDI). Arthritis Care Res (Hoboken). 2011;63 Suppl 11:S37-46. ↑ Available at: http://www.fidanoski.ca/sle/. Accessed March 29, 2015. ↑ 30 second chair stand test. https://nationalvetcontent.edu.au/alfresco/d/d/workspace/SpacesStore/efcaa5b0-1c5b-40f7-bd55-64a59158f7cf/805/fit_tb/fit011_1_lr10/fit011_1_lr10_1_1.htm (accessed 30 March 2015). ↑ Medical Multimedia Group, LLC. 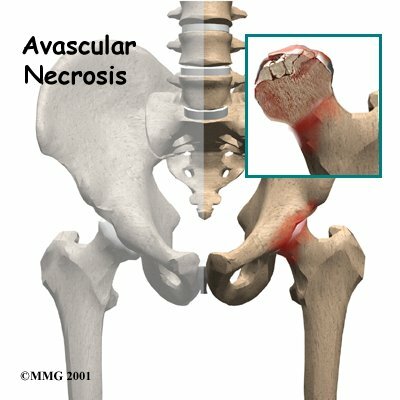 Avascular Necrosis of the Hip. http://www.methodistorthopedics.com/avascular-necrosis-of-the-hip (accessed 30 March 2015).